Missing teeth can cause a wide range of negative consequences over the years, from lowered self-confidence and difficulty speaking to significant, harmful bone deterioration in the jaw. The good news is you can have a more functional and beautiful smile again with a custom-made partial or full denture from our Murphy office. Our experienced doctors will take the time to design seamlessly lifelike and fully customized prosthetics that fit right in with your overall appearance. 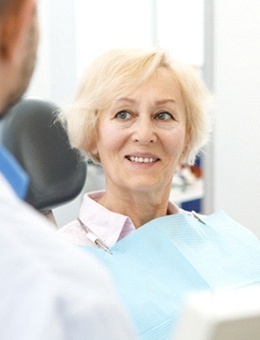 Why Choose Murphy Family Dentistry for Dentures & Partial Dentures? Partial dentures (also referred to as simply “partials”) consist of multiple “teeth” situated along a gum-colored base. The teeth on a partial are typically spread across the base so that they will fit in alongside your existing natural teeth like puzzle pieces. Most partials are secured in place with strategic brackets and/or clips. They’re also fully removable and should be taken out of the mouth when sleeping or practicing oral hygiene at home. A full denture replaces a complete top or bottom row of teeth all at once. 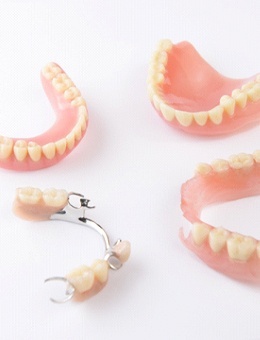 The replacement teeth on a full denture are mounted on a lifelike, gum-colored base, just as they are with a partial. Beyond this, dentures can be closed or open palate in nature. Most are held in place with natural suction; if a patient would like a little extra stability, denture adhesive can be added as well. Like partials, full dentures should be removed from the mouth when the patient is either sleeping or brushing and flossing at home.